Both in working environments and in public areas, it is important that people know where they are and where they have to go. Everyone has to use identifiers or markings for this. Where safety information is concerned, identification is in fact an absolute requirement. It is essential in all situations that the information is unambiguous to everyone and that it can only be interpreted in one way. Over a period of 25 years, Blomsma Signs & Safety has developed into an all-round contractor of a wide range of identification products and products for communicating safety policy. 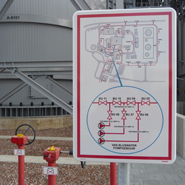 In the Netherlands, Blomsma Signs & Safety knows the safety signage prescribed in legislation and regulations better than anyone else. This means a product package that always complies with the current standards. 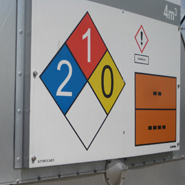 Our extensive knowledge of safety signage, combined with our experience of situations at our clients’ locations (which are often extremely hazardous), enables us to counsel them on the appropriate products. Because we make practical inventories, our product applications are always custom solutions. 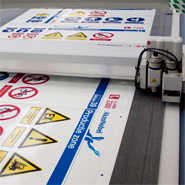 This refers to the use of standard signs available from stock as well as custom-made signing. Our graphic and technical drawing and design capabilities always let us find the optimum solution for communicating your information for improving safety. 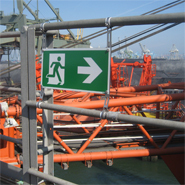 Complete safety signage product range. Over the course of 25 years, we have gained a great deal of experience in numerous sectors about the widely varying requirements imposed on safety signage. This experience has resulted in the realization of a complete product range. For projects, this package can be supplemented with options implemented by us through the sister companies of Blomsma Signs & Safety. This could for example involve combining them with interior decorations, facade signs, neon or LED or fluorescent lighting, building wraps or luxury signposting systems. You can read about this on the Blomsma Print & Sign website.